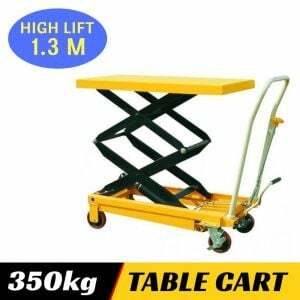 This High Lift Trolley has a lift capacity of up to 150 kg. It has been designed to prevent your back injuries by providing a smooth, easy operation when lifting heavy items in workplaces, shops and warehouses. Mobile table can be used as a mechanical aid to lift or lower heavy items or cargo that are to heavy to lift by hand. SMOOTH & EASY LOADING or UNLOADING: You can lift or lower heavy duty cargo easily by simply pumping the convenient foot pedals. DURABLE CONSTRUCTION: Made of high-quality steel, this lift table is built to last and will not be collapse. Product Assembly: Minimal assembly required. Shipping Dimensions : 102 x 62 x 49 cm.